Have your GHD straighteners stopped working? Maybe they don't heat up or they don't turn on at all? Don't panic, we can fix your faulty GHDs fast, without expense or hassle. 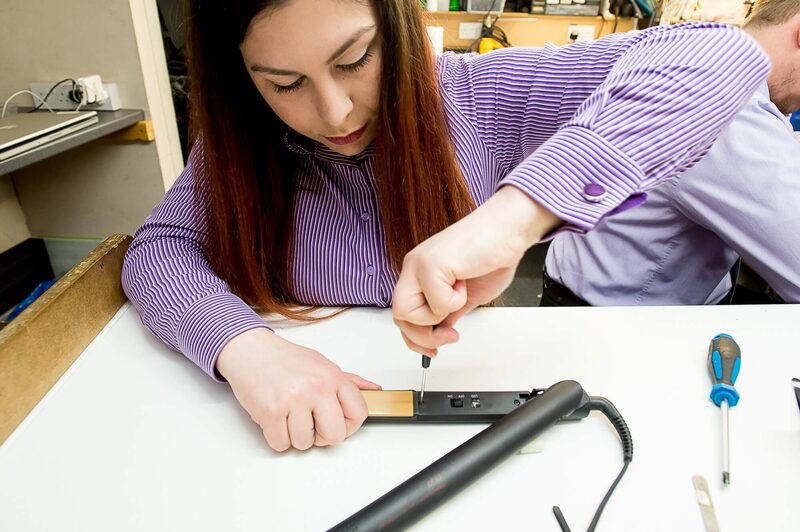 We have a one off fee of £30 for GHD repairs, and this covers all electrical parts & labour. We can even repair broken cases if your straighteners have been dropped or stood on, we are the only repair centre in Edinburgh who can repair all these type of repairs. Here at SimplyFixIt we know how important your GHD hair straighteners are to you, which is why our trained technicians are on standby aiming for a fast 24 hour turnaround on our GHD repairs. Bad hair day? GHD broken, faulty or damaged? It's simple, secure and easy to order! In the very rare occasion we cannot repair your GHDs we will always offer a full refund. So what are you waiting for? Book your GHD repair service today and have them back working as good as new, in no time. I didn't buy my GHDs from you. Can you still fix them? YES. We don't sell GHD straighteners so we don't mind where you bought them. My GHD straighteners turn on, but they don't heat up. Can you fix them? YES. This is one of the most common types of faults and we can fix that Fast. Drop your GHD straighteners into any of our stores for a speedy repair. When I use my GHDs I can hear a sort of crackly noise when the cable moves. Is this ok? That crackling noise normally means that the electrical cable has developed a break somewhere. It is not safe to continue using the GHD straighteners and you should get them repaired. The great news is that we can fix that very quickly for you. Is it possible to live without GHD straighteners? There is really only one answer to this. NO. And why would you want to? If your GHDs are not working, we can fix them for you. And it's a one off fee of just £30. The only way it could be more than that is if the plastic arms are broken. Plus, if we can't fix your GHDs, we'll refund the £30, so you have nothing to lose. Remember, your GHD straighteners is an electrical appliance and the plates achieve very high temperatures (typically 180ÂºC). So you need to be sensible and safe. Never use your GHD straighteners in the bathroom, over washbowls or near water. Use styling aids and spray products away from the iron. Never spray directly onto the straighteners. Your ghd straighteners is a robust, state-of-the-art product. Cherish it with the love and care it deserves and you will be rewarded with long, devoted service. Always switch your straighteners off and unplug it after use. Do not allow the hot plates to touch textiles, plastic materials, or heat-sensitive surfaces. Always ensure that the hot plates do not come into contact with the supply cord: this could melt away the insulation and risk electrocution. Never leave a hot straighteners unattended. Always allow the plates to cool before storing. When the straighteners has cooled, fold the supply cord in the same way as it was first delivered in its packaging. Do not wind it around your hand or the body of the straighteners and your straighteners will deliver the results every time. When the straighteners is not in use, always lay it on a flat heat-resistant surface. Never hang the straighteners by its cable.